once they go back into the hole this time they will have 14 more hours before they reach Total depth. And then they will have to bring the drill pipe out and set the well casing and get the concrete trucks in to cement those pipes in place. Then they are suppose to move over to another pad and drill two more Wells. 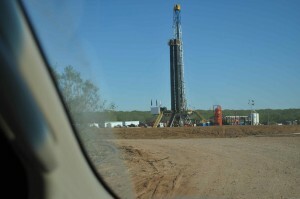 Don’t know yet if they are going to Frac this first well upon completion or not. We Also have two other construction companies on site building Roads and pads, One of the companies have the pad for the next drill site of the Rig almost ready for Cliechie and the trucks should start rolling in here tomorrow Three hundred belly dump trucks over two days. The other construction company tells us that they will start road base on the three miles of road to the other pad on wed so looks like we are in for a busy week. Stay tuned we will try with what we have to keep all abreast of what is happening to ole Luke and Inez.